The crime scenes. The P&E track from Culver City to Amoco (center) is the southern boundary of the Glen Airy District. Two sisters, May and Nina Martin, 12 and 8, disappeared from the Glen Airy District at the base of the Baldwin Hills in Los Angeles on August 23, 1924. Most houses were no more than a few years old and some streets and lots were graded but houses were yet to be built. The Glen Airy District, also known as the West Adams district for the West Adams Boulevard that ran though it, was directly south of Hollywood, and the children lived one block west of the same La Brea Avenue that is two blocks west of the Grauman’s Chinese Theater on Hollywood Boulevard. It was the same La Brea the Boy Scouts ran down to the Inglewood police station after finding the bodies of three little girls in 1937. Two other sisters’ bodies were found with the body of their friend in 1937, almost directly south of the Glen Airy district and over a barren field known as the slough or the prairie. Those three little girls were found in the Baldwin Hills south of the Pacific Electric railroad tracks of the Santa Monica line that ran to the coast, the tracks being the southern border of the Glen Airy district. Albert Dyer was convicted of the murder of Madeline Everett, 6-years-old, and Melba Everett, 9-years-old, and their friend Jeanette Stephens, 8-years-old. He was hung. 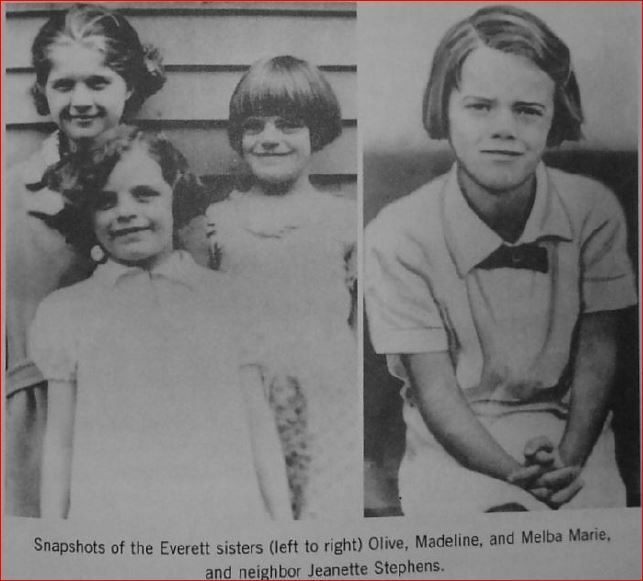 My previous book, Colder Case, explains why he was wrongly executed and mentions this 1924 case because Dyer’s lawyers and many concerned citizens thought the man, or men, that killed the Everett sisters and their friend also killed the Martin sisters about 13 years earlier. Today we would call the suspect a serial killer. From the California State Archives, this is their story, the story of two little girls whose mother and grandmother believed justice abandoned because the wrong man was about to be wrongfully executed. How could a mother and grandmother defend the man convicted of killing their little loved ones? This book will attempt to answer that question. And the answer merges into what we now know are questions of wrongful convictions. Posted on March 30, 2015 November 10, 2015 Author G. SherwoodCategories civil rights, death penalty, execution, forensics, history, serial killers, true crime, wrongful convictionTags Jeanette Stephens, Louise Teuber, Madeline Everett, May Martin, Melba Everett, Nina Martin, S.C. Stone, Virginia BrooksLeave a comment on Paperback released!